Great Skinny Pumpkin Pie Alternative! 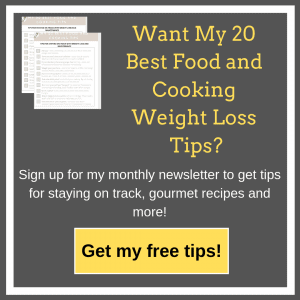 Looking for a great healthy alternative to heavy calorie-laden pumpkin pie? Try these Easy Healthy Mini Pumpkin Pies with Cinnamon Cardamom Streusel. My kids actually love these lighter pumpkin pies better than the traditional pumpkin pie. It’s one of their favorite fall desserts! Plus I love them because they are easier to make and healthier for you than the traditional pumpkin pie. 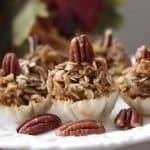 They make a great fall dessert, Halloween party dessert as well as the obvious- Thanksgiving dessert. My party guests also love these mini pumpkin pies as they can easily control their portions. You can find the Phyllo or sometimes spelled, “Fillo,” shells in the freezer section of the grocery store near the frozen pastry sheets. If you can’t find them, ask your grocery store to order them for you. I have done that a few times for a big holiday party. Also you can buy them on Amazon, I have done that too! Here’s the link: Mini Fillo Dough Shells. Do You Need the Shell? No! Of course you can always serve this as a skinny pumpkin pie pudding in dessert cups without the phyllo shells. If you’re counting points, they are about 1 Freestyle Point per heaping tablespoon of filling. Can You Make the Mini Pumpkin Pies Ahead of Time? Yes! You can make the filling ahead of time. A few hours before serving or right before serving, scoop out the pumpkin filling and place it in the shell. Leave uncovered in the refrigerator until ready to serve. I like to use the plastic tray that the shells come in to store the pies until it’s time to plate them. Delicious skinny pumpkin pie in a phyllo shell with cinnamon cardamom streusel. 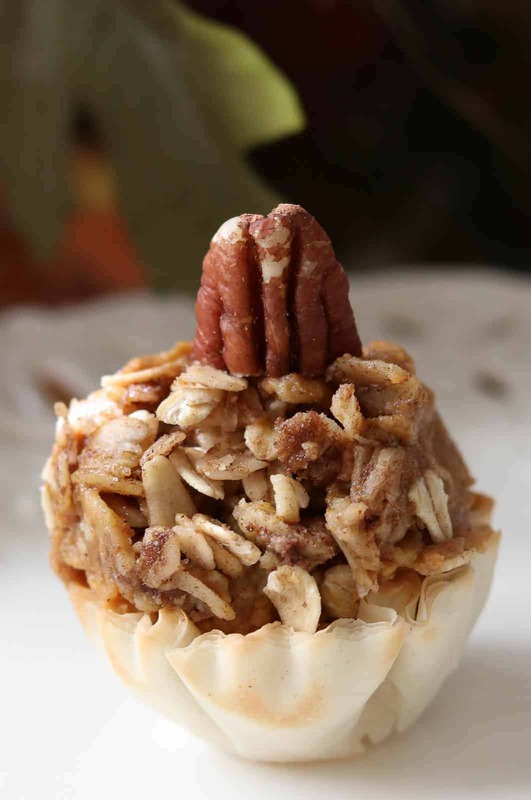 Makes an elegant and relatively quick dessert for a party, Thanksgiving or Christmas. Make the filling the day before, then fill the shells when you’re ready to serve or a few hours before. This is a great alternative to the decadent calorie laden traditional pumpkin pie and guests can control their portions. The filling will keep 4-5 days in refrigerator. Mix together first 12 ingredients (through vanilla). 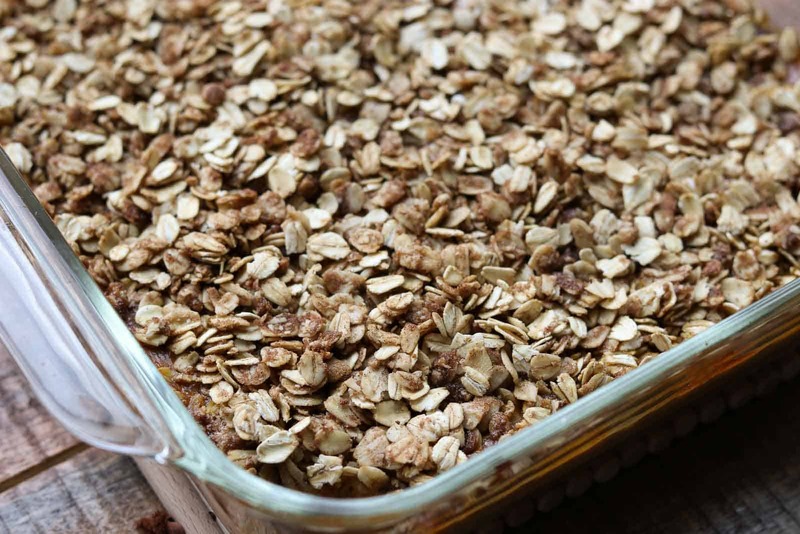 Pour into a 8×8 ungreased baking dish. Cool. Then put in refrigerator until ready to serve. These Mini Pumpkin Pies taste better the next day or when the filling is completely chilled. When ready to serve, scoop about 1 heaping tablespoon per shell into mini phyllo shells. Sometimes it’s easier to scoop, then mold the filling into the shell with your fingers. Garnish with a pecan half cut in half. Refrigerate until ready to serve. I like to make the filling the day before I want to serve it. 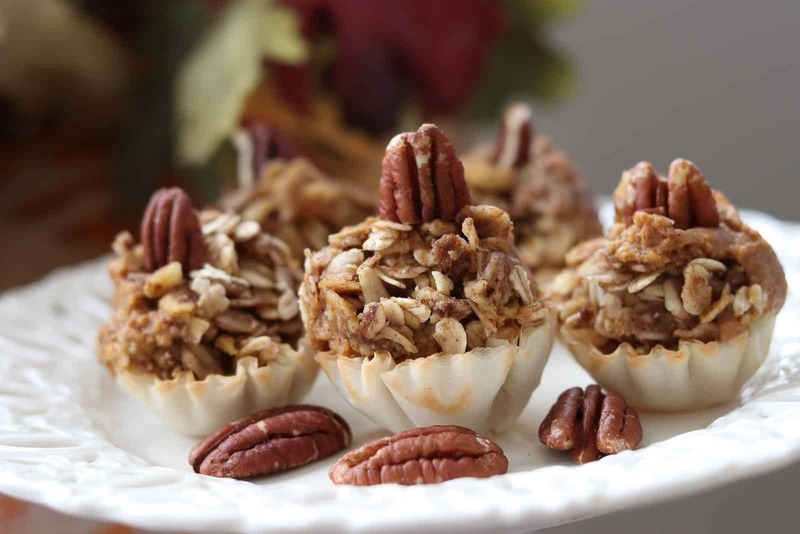 Then on the day I’m serving it, I place the filling in the shells, decorate with a pecan and store in refrigerator until dessert time. Don’t leave the filled shells overnight in the refrigerator or the shells won’t be crunchy. You can also scoop the filling into dessert bowls. The Freestyle Smart Point count is 1 point per 1 tablespoon. 5 Replies to "Easy Healthy Mini Pumpkin Pies with Cinnamon Cardamom Streusel"
Oh my, these look so yummy & perfect for my upcoming Brunch for ladies in my Neighborhood. You’ll love them Nancy! Make the filling the day before or up to a few days before and then scoop them into the shells a few hours before your party or right before if you have time. I love the crispness of the shell but if you leave them in the fridge too long, they lose that crispness. Let me know how they turn out! My family and friends just love them! I made these tonight and my family and I LOVED them!! Genius idea to use the mini phyllo cups! They provide the perfect texture compliment to the velvety filling. The amount of spices and sugar in this were perfect. Thank you so much for this recipe! Thanks so much for the comment. I’m so glad your family loved them! I plan on making these for Thanksgiving!